If you’re a marketer looking to effectively add Facebook to your overall marketing mix, consider this book the mecca of Facebook marketing. Inside, you'll discover the psychology of the Facebook user, establish a social media presence, increase your brand awareness, integrate Facebook marketing with other marketing strategies, learn to target a specific audience, and much more. Whether you're a novice or a pro, you’re no stranger to the power of Facebook. 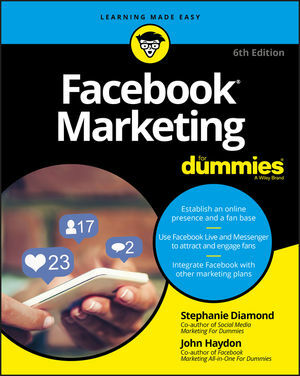 And this book makes Facebook marketing that much more exciting and easy! Stephanie Diamond is a marketing thought leader with 20+ years of experience building profits for both small business and multibillion dollar corporations. She is the founder of Digital Media Works, Inc. John Haydon owns Inbound Zombie, a consultancy that provides nonprofits with strategic training about Facebook.